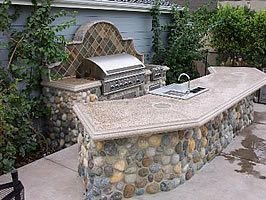 With its versatility in color and shape, concrete is becoming the newest trend for outdoor kitchens and BBQ counters. Concrete is among the most versatile and durable building materials around-for years it's been widely used to simulate other materials such as wood and stone. 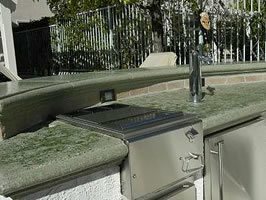 So it's no surprise that concrete is the newest trend in outdoor kitchen and BBQ counters as well. 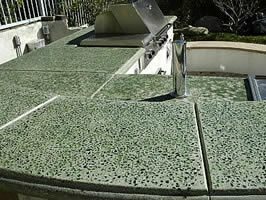 The unique "cast-in-place" construction method, developed by The Green Scene, a design and construction firm in Chatsworth, CA, allows homeowners to completely customize outdoor countertops with very few limitations. "Concrete can be tinted to an infinite amount of colors and we can add pebbles and glass chips to create a look that is more interesting than granite," says Green Scene Senior Designer Scott Cohen. "We can grind, hone and polish the counter tops to be as smooth as glass-no one would ever believe it's actually concrete." Computer generated edge forms create a nice, finished look for this colorful countertop. 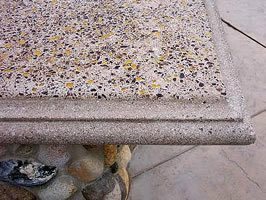 Besides the choice in colors, concrete counter tops can be made in virtually any shape and with many additional design details. "We can build cantilevered edges to accommodate bar stools, or build a full dining table with a built-in umbrella stand," says Cohen. "To dress up a counter even further, we can add a raised back splash or a veneer of flagstone, slate or tile. Low-wattage lighting beneath the counter can also create a warm ambience after dark." This unique, curved bar countertop is accented with the raised backsplash of a contrasting color and pattern in concrete. Unlike conventional tile counter-tops, concrete is virtually maintenance-free as there are no grout lines and a sealer is applied to protect the finish. Cohen also recommends that clients incorporate such elements as stainless-steel drop-in ice chests, built-in wine racks, warming and storage drawers to create the ultimate outdoor kitchen center. To make the counter tops, The Green Scene uses computer generated edge forms to create the contours of the counter. The forms are precision cut by a hot wire system into blocks of high density styrofoam. The custom-blended tinted concrete is poured into the molds on top of a reinforced counter base and is vibrated to reduce air pockets and make the counter more resistant to stains. An expert mason finishes the top until it is uniformly smooth. The process can also be used for steps and benches to compliment the BBQ center. Unique colors can be achieved in concrete that aren't always available in usual countertop materials. "It's crucial to have a skilled professional create the counter to reduce the threat of cracks," says Cohen. "We spent years developing our "cast-in-place" method to ensure the most substantial and upscale results for our clients. Our level of quality and experience is always evident in the finished product. The Green Scene, one of the fastest-growing outdoor design and construction firms in the Los Angeles area, holds contractors licenses in landscape, pool and general construction. The Green Scene employs computer-aided technology to create innovative and easily adaptable designs in addition to artist's renderings and sketches. The staff, led by supervising designer Scott Cohen, also includes garden designers, ceramic and wood artisans, masons and construction experts. At The Green Scene showroom in Chatsworth, CA, clients have a unique opportunity to view examples of custom work in concrete staining and stamping, ceramic tile and garden lighting.